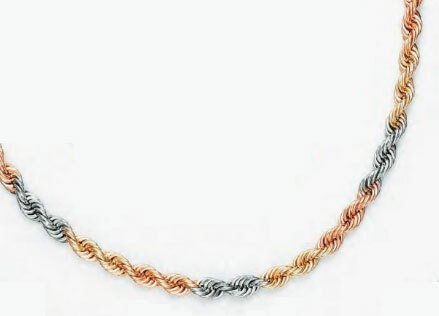 An exceptional quality handmade 14k solid tri-color gold 8mm wide rope chain bracelet for men, from Apples of Gold Jewelry. The bracelet measures a standard 8.5" length and weighs approx. 48.9 grams of 14k solid tri-color yellow, white, and rose gold! Available in any custom length (by request). Also available in 18k gold or 22k gold, also by request. This bracelet is handmade in the U.S.A. Please allow approx. 3 to 3.5 weeks for handmade craftsmanship. Also available in all yellow gold, white gold, or rose gold by request. Includes industry-standard, secure lobster claw clasp closure. We guarantee our Handmade 14K Tri-Color Gold 8mm Rope Chain Bracelet to be high quality, authentic jewelry, as described above.